I obtained a PhD in chemistry from Georgetown University, but focused my research on heritage science by having joint supervisors – professor of chemistry Richard Weiss at the university, and heritage scientist Barbara Berrie at the National Gallery of Art, Washington, D.C. The focus of my work is to develop and study gel cleaning systems used in conservation treatments. 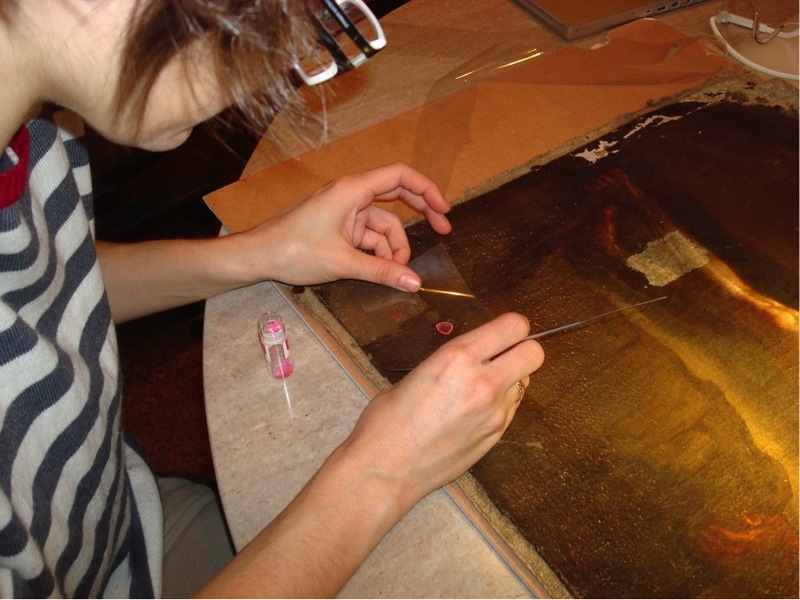 Gels are sometimes used during the surface cleaning of a myriad of heritage objects (paintings, frames, sculptures, even paper). The idea is that by holding the cleaning liquid in a thick gel, the cleaning action can be more ‘controlled’, i.e. the liquid is less likely to penetrate into the artwork, or spread and drip on the surface (if the artwork is vertical). Gels can also be used to reduce the risks posed by rubbing a sensitive surface with a cottons swab during cleaning (for example, on gold leaf decorated frames), and to clean hard to reach places, like crevices beneath paint impasto. What’s your role at the Materials Studies Laboratory at UCL? I am in the second year of my Newton Fellowship (a postdoctoral fellowship awarded by the Royal Society to external researchers who would like to work in the UK). I work with Emma Richardson in a laboratory on the top floor of the History of Art Department – we are the only scientists in the department! It’s a very different environment from working in a chemistry lab, and I really love it. There are a few instruments here, but the one I am primarily using in my research is called an NMR MOUSE (Nuclear Magnetic Resonance, Mobile Universal Surface Explorer). The instrument allows me to look into paint films, and trace how liquids from different types of gel cleaning systems move into the paint. I am studying several gels which are used by conservators and hoping to clarify how much ‘control’ of the cleaning liquid they actually present, relative to just using a cotton swab wetted with the cleaning liquid. 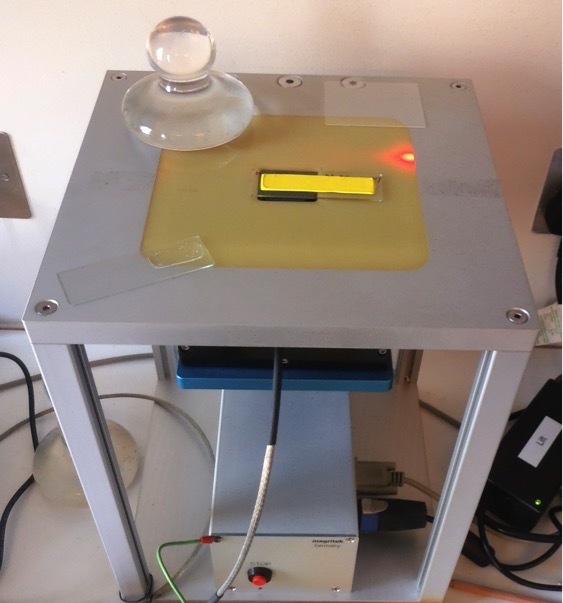 The NMR MoUSE (the tiny black box on the blue platform), in the process of scanning a paint-out which has just been treated with a gel. Last year I worked with a conservator who was treating a painting which had been largely overpainted centuries after its production. The overpaint film was very stiff and had extensive craquelure – when he tried to soften the overpaint with a wetted cotton swab, the cleaning liquid would be drawn through the cracks into the original, sensitive paint layer beneath. We were hoping that by using a gel, we could slow this process, and soften and remove just the tough, top layer of overpaint. Although the gel did allow some control and prolonged exposure of the overpaint to the cleaning liquid, it was not sufficient to soften it without having some of the liquid penetrate through the cracks to the original paint beneath! The treatment was incredibly challenging, and the conservator opted to use a gel on some areas and cotton swabs on others. Applying a fluorescent gel to a test-panel during my PhD – the fluorescent solvent can help us trace its penetration into the paint. I really admire competitive and determined people who are passionate about what they do, both in their professional work and in their hobbies, especially if they’re women. I get to combine the two things I was always most interested in as a child – science and art. I can make paint-outs in the morning and study their chemistry in the afternoon. I can look at the topography of a painting through a microscope – which feels almost like looking at the surface of the moon to me. Being a scientist can be demanding, of course, but as an academic, I get to choose what research I pursue, at what time I come in and leave work, and what the radio is playing in the lab. To top it off, I get to work with a very diverse group of people – conservators, art historians, artists, and scientists from a very wide range of disciplines. There is an inexhaustible supply of fascinating questions and problems to explore, and there is always a clear application which makes my work feel really worthwhile.